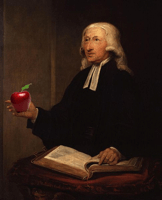 John Wesley shared health advice as part of his ministry. Faith & Leadership recently interviewed John Wesley scholar Randy Maddox about Wesley’s emphasis on physical health throughout his ministry. “Of all Wesley’s books,” Maddox states, “the one that stayed in print the longest and went through the most editions wasn’t his sermons or hymns. It was ‘Primitive Physick,’ a book on medical advice. It was central to his work” (Randy Maddox: John Wesley says, ‘Take care of yourself’). It would be odd in the 21st century for a clergy person to give medical advice, but not so in the 18th century. Maddox does a great job explaining practical reasons why, but also shares how this practice of caring for the body also grew out of Wesley’s theology. The online article quickly points out a difference between Wesley and much popular theology today: “’Wesley is convinced that God cares about the whole person,’ Maddox said. ‘He doesn’t see the spiritual and the physical as separate.’ Wesley believed that God wanted human flourishing in every dimension, indeed, the flourishing of all creation” (Randy Maddox: John Wesley says, ‘Take care of yourself’). Many of us nod in agreement with the theology. We even agree with it as an outreach/mission strategy. But do we practice it? Are you and I living integrated lives, caring for our whole selves – body, mind, and spirit? We often hear how some our colleagues spend the majority of their time in the Word preparing for sermons, and most of their prayer time on Sunday mornings, or opening and closing church meetings. We hear of others who read only when prepping a sermon series, or as a requirement for a continuing education class. We know others whose most physically demanding exercise comes when walking from their desk to the copier. We know of those who don’t sleep enough, those whose families feel neglected, and those who have become bitter and angry. Somewhere along the line we were told to give our whole lives to our ministry, which we interpreted as meaning any time taken for ourselves is selfish. I once heard a bishop tell a group of new ordinands that if they were not putting in at least 60 hours per week, they were not doing ministry properly. As a result, we feel the need to pour every ounce of our energy into our ministry, leaving little for ourselves or anyone else. We associates and other staff members can especially feel the pressure. Maybe you serve with a workaholic lead pastor, codependent upon the congregation for his or her self-worth. Under that type of leadership you will receive messages, overt and subliminal, encouraging you to put every waking hour into work. The workaholic lead pastor will not understand that you spent the afternoon reading at the local coffeehouse or arrived late to the office because you spent the morning journaling. Others of us feel our congregation doesn’t fully understand what we do, or what we bring to the ministry of the congregation. Those may feel the need to be as visible as possible. They want to be seen working, not out on the street jogging or at the Y swimming. Some of us put in extra hours because we are trying to make a name for ourselves. Remember, you are not in ministry to get you-followers, but Christ-followers.